It’s sometimes those little things that make such an impact. Sure, you can read an article and be moved by its content, but, does it have a life-altering effect? In 2000, I decided to leave my job as an illustrator (for a while) when I learned I was expecting our 3rd child. At that time we had 2 boys ages 3 and 6 and we thought the timing was right to be home for a while. When I received an issue of American Artist in June I saw there was an article about colored pencil artists – which was rare…I eagerly opened the pages to find “Take 4 – 4 colored pencils artists” Each artist selected an object and sent all 4 around to each other to work from. The result was 4 wonderfully different compositions from 4 amazingly talented artists. 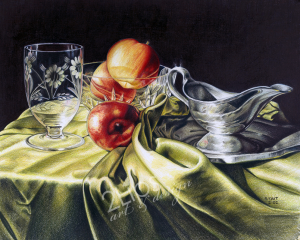 But, there was one artist whose work blew me away: Barbara Edidin’s “Strawberries & Cream” just couldn’t be colored pencil. It was too real, too perfectly beautiful to be “just” pencil. I showed it to my husband….”it’s a photo” he said. I nearly wept when I saw this piece and a great epiphany came over me. For years, as an illustrator, everything I had ever drawn had been the conception and property of my clients. I didn’t know what “my” art was. Maybe I just wasn’t creative. Maybe all I could do was draw. It ate at me – I felt like a fraud when I said I was an artist, which was wrong (illustrators ARE artists) but that’s how I felt. When I saw what Ms. Edidin had accomplished in colored pencil I was floored. I’d been using colored pencil for illustrations and portraits since I was 14 years old. But still life? Wow….I became galvanized. I ran around the house collecting any objects I might use to put together a still life scene, set it all up in front of my living room window where the best lighting was and grabbed my camera, shooting about 2 rolls of film. When the pictures returned I selected one immediately that I really liked – it had a look of the old masters. Flash forward one year (that darn baby kept me busy) and I was chomping at the bit to start this piece in colored pencil. I painstakingly began this project, which ended up taking 4 weeks since colored pencil is really time-consuming and I could only draw at night when everyone was in bed. The end result was “Red & Green #1” . I was ecstatic – I loved it and I found my inner fine artist. This was a huge discovery in my artistic journey and it all happened because of one article in one magazine. Great fashion illustration workshop in NYC!